Wij horen graag wat uw ervaringen zijn geweest. Robert-Jan and Caroline's house in Solterra Resort exceeded our expectations! The pictures and descriptions are accurate - the home is beautiful, modern, stylish with any amenity you might need. Any questions or requests were immediately addressed by the hosts. This house will not disappoint! Thank you so much for your wonderful review Tara ! We do all we can to have our guests enjoy the home and Resort as much as possible. Great to hear that worked for you and your family ! Thank you also for taking care of our home, you treated it as if it were yours. It was a wonderful experience at the villa. Well maintained and very comfortable. Close to everything we wanted to see ! Thank you so much for your kind words ! We are so happy you enjoyed your stay, and we loved having you as our guests. You treated the house as was it your own. We hope to see you back in the near future ! Such an amazing experience!! Owners are a delight to deal with. Home has everything you need. Care was taken in making sure of that! Close to all the parks, wonderful golf courses, groceries and restaurants. Beautiful resort community. Will definitely be back for more of this great place!! Thank you so much for your kind words Sylvie! We were so happy having you as our guests; you treated the house if it was your own ! We are looking forward having you back as our guests next year ! Thank you for your kind words Sarah ! We were so happy to have you and your friends as our guests and we try to do our best to have our guests enjoying our home to the max ! Thank you also for taking care of our home, you treated it as if it were yours. Hopefully until soon ! Na de lange reis naar ‘huis’, soepel ingecheckt en op de oprit geparkeerd. Het huis is in een vrolijke Kerstsfeer. En als je dan binnen komt, ben je meteen weer vol energie. Wat een ruimte en comfort! Heerlijk. Het welkomst pakket was zeer attent. De volgende ochtend vroeg wakker, uiteraard, en ineens bedenk ik me dat we het huis toch helemaal gezien hebben, maar waar is dan de speelkamer??? 🤔 Op zoek en snel gevonden. Om 5:00 onder het genot van een bakkie koffie een potje pool en een paar videogames gespeeld 😂😎 Vakantie!!! A really nice place to stay with family. Comfortability and location can’t be better if you plan to visit parks in Orlando. Thanks to Robert and Caroline for his kindly hospitality. Thank you so much for your wonderful review, Paula ! We do all we can to have our guests enjoy the home and Resort as much as possible. Great to hear that worked for you and your family ! Communication with you was easy as well. Thank you also for taking care of our home, you treated it as if it were yours. Hopefully until soon ! Amazing place, everything is just perfect!! Thank you so much; we loved having you as our guest ! Thank you so much for the wonderful review ! We loved to have you as our guests, and you treated the home as if it were your own, leaving the house in a perfect condition after your stay. We are so happy your kids enjoyed the game room as well. We do all we can to make our guests have a magical stay in our villa ! We would love to have you back as our guests. Again, thank you ! Stayed in this lovely villa for the last two weeks of October and can’t praise it enough. What a brilliant find. Beautiful villa, excellent service and welcome package was fabulous. Thank you. Can’t wait to return in August 2019! Thank you so much for your kind words. It was a pleasure having you as our guests and we are looking forward having you back in August. The villa will be waiting for you! I almost hate to tell everyone how great this place is. Our family will definitely return. The home is beautiful and comfortable. Every room is decorated perfectly. All bedrooms have televisions. Those with young children will appreciate the safety features for the pool area. There is a net gate (removable) to separate the patio area from the pool. There is also an alarm that sounds if the doors out to the pool are open without first pushing the safety button which is placed high enough that young children can not reach. Another nice feature is the side door off the patio which enters across from a bathroom. The patio/pool area is a nice place to relax, with plenty of seating. Our kids loved the game room in the garage too! The resort area itself is really nice too with lazy river and water slide. The home owners are easy to communicate with and respond quickly. Thank you so much for your great review, Charity ! We are so happy you and your family enjoyed ! We do all we can to have our guests enjoy the home and Resort as much as possible. And we are so happy it worked for you and your family ! Communication with you was excellent and we appreciated your responsiveness. Thank you also for taking great care of our home, you treated it as if it were yours. We would love to see you back in the future ! Booking was easy, great communication with the host. Their villa A touch of Dutch was beautiful and comfortable! Great for Family and Friends to enjoy a weekend getaway. The Orlando Parks are only a few mins away. I hope to be back soon ! Thank you Robert-Jan En Caroline!!! Thank you for the kind words Clarissa ! We were so happy to have you and your friends as our guests and we try to do our best to have our guests enjoying our home to the max ! Wie een hele mooie villa op een rustige locatie zoekt is bij Villa a touch of Dutch aan het juiste adres. De villa is van alle gemakken voorzien en het ontbreekt je aan niets. Het zwembad, met groot pooldeck en genoeg stoelen en ligbedden, is voorzien van een safety net, ideaal voor gezinnen met kinderen. De villa is centraal gelegen en met 15 minuten ben je in de parken of de malls. Dank voor de mooie woorden ! Fijn dat jullie genoten hebben ! Wat een heerlijke villa!! En hoe fijn dat we hier konden verblijven. Een villa zoals je hoopt dat hij eruit ziet; schoon, fris, licht, geen prullaria, en met een vrije uitkijk bij de pool. Deze villa heeft het allemaal. Op een van de mooiste, rustigste plekjes van een fijn resort, waar nog veel bij gebouwd wordt. Een prima gym waar het 's-morgens wel behoorlijk druk kan zijn en een leuke community pool. Maar door het heerlijke huis, prima uitgerust, met alles wat je nodig hebt, en ook met een super gameroom, zijn we bij de gezamenlijke pool maar 1 keer geweest. Enige nadeel zou de ligging van Solterra kunnen zijn ten opzichte van veel van de attractieparken en malls. Het verkeer op de I4 is enorm, maar met een sluiproute hier en daar kom je er wel. Het is ten slotte vakantie en dat kan in dit heerlijke huis van Caroline en Robert-Jan fantastisch. Hopelijk kunnen we nog vaak hier zijn! Dank je wel voor de prachtige review Twan en Christel ! We doen ons best om de villa in top-conditie te houden, en te zorgen dat het onze gasten aan niets ontbreekt. We zijn blij dat dat bij jullie gelukt is, en we kijken alweer uit naar jullie volgende verblijf ! This place was great! 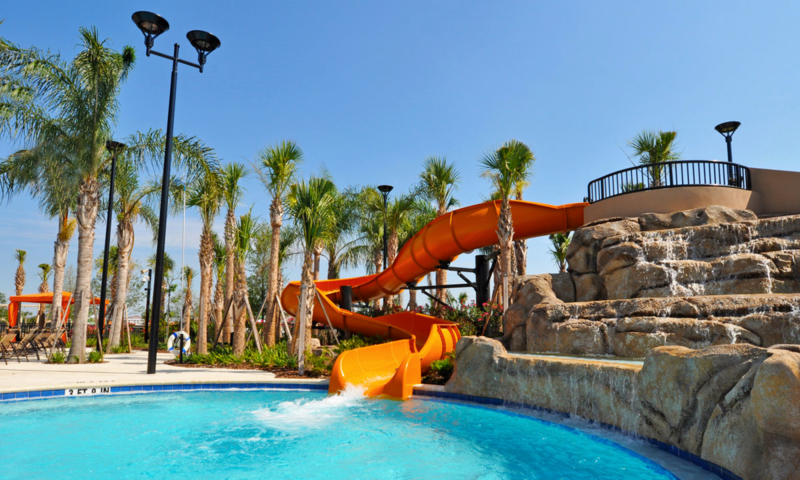 My family loved the amenities of the resort and house so much that my kids didn't want to leave - even to go to Disney. We will definitely be returning. Thanks. We are so happy to hear that you and your family enjoyed our home, and that your kids didn't want to leave, not even to Disney ! Thank you for the excellent review; we do what we can to make every guest have a great stay and to have them enjoy the home and Resort as much as possible. We loved having you and your family as our guests, and we would love to see you back a next time ! The villa was excellent - super clean with everything that we could want in a vacation home. The pool area was great and not overlooked by the neighbouring homes. Our older kids used the games room daily. The resort and its amenities was also perfect with the villa in a quiet area but close enough to the community pool and facilities - as well as not too far from the theme parks. Communication with Caroline and Robert-Jan was also excellent with super quick responses to any queries. We rented a bbq grill from Pilgrim Rentals as recommended by Caroline and Robert-Jan and this also worked well with a brand new grill there for our arrival. We have stayed in many vacation homes in the Champions Gate area and this was one of the best. Many thanks for letting us stay! Thank you for the excellent review; we do what we can to make every guest have a great stay and to have them enjoy the home and Resort as much as possible. We loved having you and your family as our guests, we appreciated the communication and responsiveness, and we loved that you took great care of our home, as if it were yours. We would love to see you back a next time ! From the moment we chose their beautiful home they messaged us and made us feel comfortable. Renting from a stranger can be different. They made us feel comfortable the entire process. We arrived at their beautiful home and it was more stunning than the pictures. Priced so reasonably. Fully stocked with towels and who doesn't love a pool and full play room for the big kids. Free play on the arcade games made the kids so very happy. Garbage comes daily the house was perfectly clean and we are very picky. They left us a welcome note and some hospitality items. Never expected always appreciated. The house is located in a safe quiet resort like community. Gate check in was a simple and they gave is a map at the gate for the resort amenities. We enjoyed a movie at the club house while inside their pool. The areas seems to be a mix of vacation renters and some people who actually live there. All were very kind. There is a hot tub at the club house as well as a fitness center. Super beautiful community. Back to the house. We had a party of five. Three kids 5, 10 and 18. It has a pool door alarm to notify you if the door opens. This was helpful with the kids but the pool does have a fenced area around it. Keeping the house clean wasn't hard at all. There is a washer and dryer in the house. There were crayons and coloring books for the kids in the TV stand. WiFi for the family and even a Keurig so bring some kcups. Our hosts were great. We plan on returning. The house is only a few minutes to every Disney park. We chose to shop at the local Publix grocery story in Davenport. There is a Walmart near by but we loved that local grocery store. The house was equipped with Netflix and other internet channels as well as cable. This is a must rental if you have any hestiations ask your hosts. They go over the top to help make your trip great. They never bothered us the whole trip. Checked in afterwards to make sure our trip was great. We love the baby palm tree in the front yard! Kids say the arcade room is most memorable. We were just happy to sleep in comfortable beds after a long day at the park! Thank you Alisa, for the excellent review ! We do all we can to have our guests enjoy the home and Resort as much as possible. We are thrilled to hear that it worked for you and your family. Communication with you was easy and we appreciated your responsiveness. Thank you also for taking great care of our home, you treated it as if it were yours. We would love to see you back in the future ! I work in the hotel industry and I was truly impressed with our experience. It started from the moment we booked, the communication started and it was five stars. Caroline en Robert-Jan (the owners) cared about the reason for our trip which was to celebrate our son's 5th birthday at Disney World. Upon arrival a cake and card was waiting for our son, what a nice and thoughtful touch! They truly made us feel like family. The house is amazing and has everything you need to keep a family happy and busy on vacation. The inside has all the major comforts of home with large TV's in each room all the way down to a standard coffee maker and/or a Keurig plus large beach towels for the pool, it has it all! The game room for the kids and adults was used daily and so much fun! The outdoor pool, seating, gate around the pool and pool door alarm was incredible. With our kids ranging from 4-9 it was nice knowing every step was taken to make sure they are safe. The resort community pool, lazy river, outdoor games and restaurant/bar poolside really made it feel like a high end resort. I will recommend this house to anyone traveling in the area. It's close to Disney and all the attractions. I can tell you my family enjoyed the house as much as any attraction in the area which says it all. Thanks for a wonderful vacation home and we will be back! Villa A Touch of Dutch is the best! We are so happy with your review; we do all we can to give every guest the best experience ! We are so happy you and your family enjoyed the home and Resort as much as you did. It was great having you as our guests; you treated the home as it was your one, the communication was quick and you even helped us out where you could. We would love to see you back a next time ! My family and I stood at this home for 6 nights and it was beautiful! The house was very clean when we arrived and came with everything we needed during our stay. The pool was very nice. My kids loved the game room. They made sure to go at least once a day. We did explore the resort a little bit. The location of the home is also perfect. It’s very quiet but close to a lot of things! Overall, our stay was great and else are extremely grateful for allowing us to stay in their home. Thank you for the great review; we do our utmost to make every guest have a magical time and to have them enjoy the home and Resort as much as possible. We are so happy it worked for you ! We loved having you and your family as our guests, we appreciated the communication and responsiveness, and we loved that you took great care of our home, as if it were yours. We would love to see you back a next time ! First, our background, we are a retired couple who have had maybe 12 vacation stays in the last 10 years since retirement. If you are new to renting holiday homes, in my opinion they fall into 2 categories, 1, Adequate for rental. or 2, Exceeded expectations where the owner ensures the home is of furnished and maintained to the highest standards. This home more than met our level 2, plus the communication with the owner is excellent with replies in hours or less, not like some where you wait days. If you are looking to rent in this area, I cannot rate this property, the owners Robert-Jan and Caroline, plus the support by their management team, highly enough. It was a great area, great location, and the house was beautiful. Our trip was great !